When you have the support of a customer-focused company like DIYPoolfence.com, installation is a cinch. We have developed the steps to the left to walk you through every phase of planning, purchasing and installing your new child safety fence. Simply click on any of the phases of safety pool development to display a list of the steps in that phase or click on the step itself. If you would like to print the complete instructions to bring pool side during installation or to show your significant other how easy installing a pool fence is, click the button on the bottom that reads "printer friendly version". DIY is here to help you get the job done right. We provide technical support from 9AM to 9PM (EST) 7 days a week. (877-349-3362) We're not happy until your safety fence is installed and your loved ones are safe. Planning is the first step of any successful project. Decide where you would like your fence to surround; the recommended distance to stay from the edge of the pool is 2 feet or more. Never plan to run your fence within 8 inches of poolside. While planning your fence, make sure no other activity other than the pool is within the protected area. Children should never need to enter the pool fence area other than to swim when properly supervised. If toys and other objects are stored within the protected area move the storage area. Take a thick rope, garden hose or other similar object and place it on the intended path of the fence. Step back and look; ask yourself is there anything on the inside of the fence that will attract my child? Will I have enough room to move around to clean my pool? Mark the beginning and ending points of the fence of your rope or hose. Pull the hose straight and use a tape measure to measure from the marked beginning point to the ending point. Planning your entryway is an important step that should be taken in consideration prior to deciding how many fence sections, ground sleeves, and poles are needed. Our fence does not come with a hinged gate. An opening on our fence is where two sections of fencing meet. When two sections of fence meet there will be two poles next to one another connected by a spring loaded spring-loaded hook and eye. To enter the pool area you would follow the same procedure as you would if you were removing the fence; unhook the spring-loaded hook and eye and remove the first pole of the section from the hole. Now you can either role that pole along the mesh to the next pole in the section and place it in a set back hole or pull the pole back at an angle away from the fence and place it in a set back hole. You can create as many openings as you would like, the fence will remain taught and secure. We recommend the design of the opening be either 3 or 6 feet wide and should be located near the steps or where you would naturally enter the pool. When purchasing your supplies you will need to know how much fencing to buy. Measure along the rope or garden hose already laid out. Each of our lengths of panels are 12 ft wide and have a 2.25 inch spacing between them. Measure from the center point of a 6 foot gate to the end of each run and figure out how to use the panels most efficiently, often it is possible to utilize all the panels as full panels except the final one. The final hole most likely will not be a full 36?for the last pole in that section of fence. This is OK; the fence is designed for easy modification to end where you need it. Much as you are doing right now. 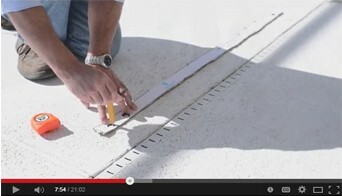 Review DIYPoolFence.com to be sure you understand all that will be involved in constructing your pool safety fence. Knowledge before you make your purchase will lead to satisfaction after you receive the product; this is the philosophy we used as a guideline for building our site. Strategic design of our site has placed us as a premier resource for information on fence design as well as a leading supplier of affordable, quality pool fencing safety materials. Review the additional pieces and your design. Ask yourself if you need extra poles? Extra poles will require extra sleeves. Are you splitting a run of fence to create an entryway? If so, you will need extra fence junction spring-loaded hooks & eyes, the ones that come with the kit will still be used at the ends. It is beneficial to include all necessary parts in a single order, not only will your get you project started faster but you will save in shipping. DIY Pool Fence also offers toll-free customer service 9-5 ET Monday through Friday. A live customer support representative, not a recording, will promptly assist you. In addition we offer toll-free technical support to answer all of your fence planning and installation questions. Technical support can be reached 7 days a week from 9-9 ET. DIY Pool Fence has an easy to use online ordering system. We have worked hard to simplify the purchasing process and bring the highest level of online security. Shipment tracking is offered to keep you in continual update on the status of your shipment. a) You can order fence by the foot. Your fence will arrive in twelve-foot sections and if the length ordered is not a multiple of twelve the last section will be less than twelve. Example: If you were to purchase of 27 feet you would receive 2 twelve-foot sections and 1 three-foot section. b) A pole comes with every three feet of fence purchased. You need to end your fence with a pole. If your end measurement is not a multiple of 3 than you would need to purchase an extra pole. It will automatically be added to your shopping cart. Example: If you were to purchase 25 feet you would receive 2 twelve-foot sections and the first pole of the one-foot section. The second pole of the one-foot section would need to be purchased separately along with an extra ground sleeve. c) If you are planning to go up stairs you will need two poles per every step, plastic ground sleeves for the poles and spring-loaded hook & eyes to connect the poles. Example: If you have your base level, one step, and the upper level you will need a pole at the edge of the upper level, 2 poles for the one step and a pole at the beginning of the base level. Then you will need two spring-loaded hook & eyes; one to connect the pole at the top level with the first step pole and the other to connect the pole at the end of the step with the base level pole. You will also need plastic sleeves to go with each extra pole. Your fence comes with a hole template. Mark your entryway first with a pencil. The entryway is a point where you want two sections to meet so you can unhook them from one another and enter your fenced area. If you purchased a hinged gate: proceed to the measurements section of this manual for the gate and mark the gate holes first, then return to this section of the manual and proceed with marking the fence holes. After marking the entryway, continue using the template to mark your fence both directions from your entry way. You can change directions at every pole. After every 5th pole you will have two poles next to one another where you are starting a new section. 2.5": Spacing between fence sections where two poles will be next to each other. Grip the drill with two hands, one on the handle to pull the trigger and the other to steady the top of the drill. For straight runs position the bubble in the center of the circle. For turns of the fence, stand outside the turn and face it. Lean the drill in towards yourself until the bubble is either on the edge of the circle or centered on the dot. The top of the pole should be leaning away from the turn. If the fence is a straight run or only slight turns then position the bubble in the center of the circle. Also use this setting for drilling the holes for gate posts. 1. Plan where your gate will be. This should be marked out on the pool deck first, and then the fence should be measured off in both directions. PLACEMENT TIP: Don't put the gate on a corner, the effect the tension of the fence will have on the gate may cause locking alignment issues. The gate works best in the middle of a straight run of fence. 2. First lay out a tape measure and mark the two outside holes. The measurement center hole to center hole is 35". MEASURING TIP: don't use the end of the tape measure as the starting point for measuring, it is far more accurate to pick an inch mark and measure 35" from that inch. 3. Measure in from both those marks towards the center of the gate 2 ? and mark the inside center holes. 4. Before drilling your gate holes, use your fence template to mark your first fence poles off each side. These will be placed 2 ? center hole of the outside gate post to center hole of first fence pole (This is the same spacing as that used in between fence sections). 6. You can place the hinges on either the left or right. Insert the two gate trusses with the tall top plate on the latch side. 7. Attach your hinges and latch to the flat metal supports welded to the gate trusses. The gate should swing out away from the enclosed pool area (if you are standing outside your fenced area it should swing toward you). 9. If extra support is needed (recommended) there are two holes in the base flanges of the trusses. (note: the base flanges are supposed to only be welded on one side) Using 1/4" x 2 1/4" concrete wedge anchors purchased from a hardware store, use those holes to bolt the trusses to the pool deck. Drill holes for anchors using bit size recommended on anchor package. 10. Angle the end poles of the adjacent fence sections toward the gate using the mid circle point on your drill guide (used previously for slight turns) towards the gate. 11. Using a 1/16 bit drill a hole in the outside pole of the frame to hook your hook & eyes to the adjacent fence posts. This is just a pilot hole, the hook and eye are designed to be self tapping. Attach the poles to the gate trusses using the hook and eyes. Drilling should be done using a 5/8 masonry drill bit and a rotary hammer drill. Drill your hole at a depth of 4". It is best to mark your drill bit using electrical tape at 4" from the bottom of the bit. Many times when drilling 4" you will reach the bottom of the pool deck and reach dirt. This is ok.
Drilling should only take a few seconds per hole however concrete decks are made of different types of concrete in different areas of the country - drilling may be slower if your concrete is harder. If drilling starts very slow from the beginning, be sure your drill is set to rotary hammer; the action of the bit should be spinning and pulsating up and down simultaneously. If drilling slows do not use more pressure as this will not make it go faster; the motion of a rotary hammer drill is not such that pressure will make a difference. You may need a new drill bit if drilling slows. If you hit rebar stop. You can purchase rebar drill bits that can cut through it. Do not drill on joints - reposition the fence direction instead to skip over the joint. Wear protective gear at all times when drilling and keep children away from the drill. When you finish a hole move the drill up and down in the hole a few times to clear away concrete dust. You can also use a shop vacuum to help clear concrete dust. 1. Before starting: practice holding the drill at the different angles a few times and even try a few test runs in dirt to get a feel for what the drill feel like when in motion. 2. Line up the tip of the drill bit on the center of the mark for the hole. 3. Find the correct position on the bubble level that you desire from the previous page. 4. Drill for approximately 5 seconds and stop. During drilling the bubble will shake around; when you stop check that your bubble is settled on the correct position. 5. After confirming position resume drilling. Continue this starting and stopping a 3-4 times while drilling your hole to be sure your angle is still correct. Every hole should have a plastic sleeve inserted into it. Important: The sleeve should be tight in the hole however you should be able to push the sleeve about 80 percent of the way into the hole pushing down with the heel of your palm and tap with a blunt object like a mallet the remaining way in. If you cannot, do not force the sleeve. Pull it back out and using your drill run the bit up and down the hole putting slight pressure on the side walls of the hole. Then try reinserting the sleeve. If you force the sleeve the pole will also be tight and make it more difficult to be removable. Next stand your fence upright in the holes with sleeves in them. When you are first installing the fence expect there to be tension to reach from base of pole to base of pole. Tension at the top of the poles however is not achieved until after the sections of fence are fully attached to one another by hook and eyes. 1. Drill your last hole where you need it. 2. Measure from the last hole to second last hole; center hole to center hole. 3. Remove the backing by unscrewing the screws on the back of the pole using a screwdriver. 4. Measure on the mesh the same measurement you measured on the ground Add a 3/4" then cut the lining; then measure 1.5" or more of mesh and cut. 5. Lay the pole centered on the original measurement. The extra lining should go past the pole. 6. Fold the extra mesh and re-attach the backing. Cut off any extra mesh to clean up the look of the fence. If you are making a complete circle with your fence just use the hook and eye to create tension by screwing the two hooks to both poles. The hole in the pole is between the first and second screw from the top.